Long and violent the history of the Cathedral is intertwined with that of Carlisle itself. Visit the new Carlisle Cathedral images gallery. Carlisle Cathedral. See more photographs at the new Cathedral images gallery. 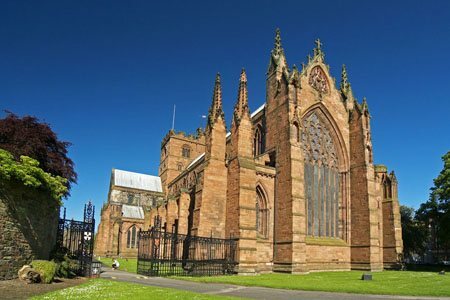 Welcome to the EDGE Guide to Carlisle Cathedral. Built on the site of an earlier (possibly 8th century) church. 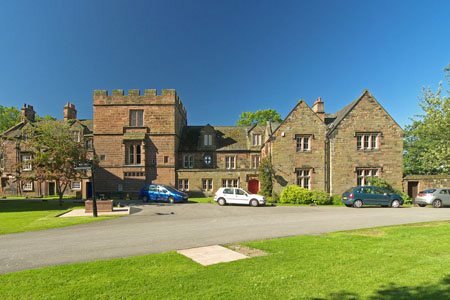 The present building had rather smaller beginnings dating back to 1102 when by order of Henry I, a new church was built for the people of Carlisle. In 1123 Henry I had the church rebuilt and it became a Priory, then in 1133 it was upgraded to a Cathedral. The increase in status may have been for political reasons. 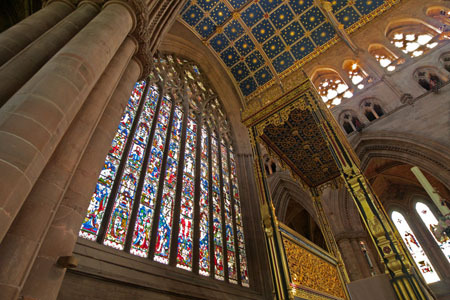 The Cathedral was run by Augustinian Canons under Carlisle's first Bishop Adelulf of Nostell. This was a time of great building activity and Carlisle was established as a place of importance. The altar and east window, Carlisle Cathedral. See more photographs at the new Cathedral images gallery. The Cathedral was badly damaged by fire in 1292. Much rebuilding took place as a result, gifts of money for this purpose was still being received as late as 1362. In 1297 Robert Bruce swore his allegiance to the English Crown in the Cathedral in front of King Edward I. The Cathedral's history is bound up with that of Carlisle as you would expect since it is in the centre of the city just off the main square. For more on the history of Carlisle click here. The Prior's Tower, Carlisle Cathedral. See more photographs at the new Cathedral images gallery. This is a charming group of buildings and should be visited when in the area, the interior is particularly pleasant. 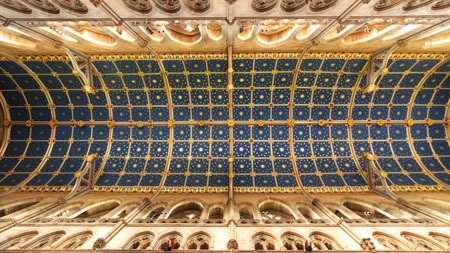 See more photographs on the Carlisle Cathedral image gallery.